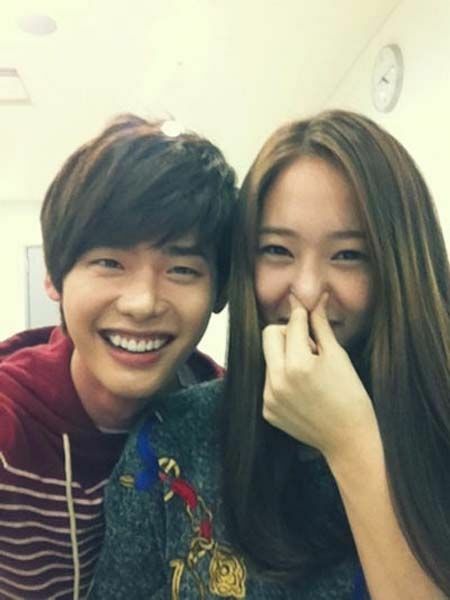 On February 28th, 2012, Lee Jong Suk published a photo of him with f(x) girl group member Krystal via me2day. In the photo, both of them stood intimately close by shoulder to shoulder, Lee Jong Suk grinned, seemed very happy, while Krystal tightly pressed to cover her nose as if there was peculiar smell on the body of Lee Jong Suk. Netizens commented on the photo of Lee Jong Suk and Krystal, “Let me se the photo of real collapse,” “Sister why cover the nose?” “A pair of beautiful people” and so on. Lee Jong Suk and Krystal are starring in the role of siblings who fight over everything in MBC sitcom High Kick 3 – Counterattack of the Short Legs, and are well liked by audience.